EASTON, Md. — The auctioneer told the small crowd huddled outside the Talbot County Courthouse that the property would be sold “as is” — rectory, bell tower, oak pews and rose-tinted stained glass windows included. “Who gives $700,000, 700, 700?” he called out. One man, a representative for a local bank, raised his finger. The auctioneer tried in vain to nudge the price up. “Sold!” he cried. St. Andrew Anglican Church had just been bought by the bank that had started foreclosure proceedings against it. “It’s probably good for my soul to be taken down a notch,” said the Right Rev. Joel Marcus Johnson, the rector of St. Andrew, after the auction. During this holiday season of hard times, not even houses of God have been spared. Some lenders believe more churches than ever have fallen behind on loans or defaulted this year. Some churches, and at least one company that specialized in church lending, have filed for bankruptcy. Church giving is down as much as 15% in some places, pastors and lenders report. The financial problems are crimping a church building boom that began in the 1990s, when megachurches multiplied, turning many houses of worship into suburban social centers complete with bookstores, gyms and coffee bars. 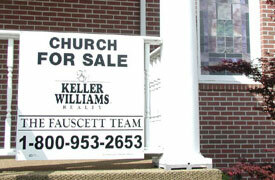 Lenders say mortgage applications are down, while some commercial lenders no longer see churches as a safe investment. “We are seeing more stress in churches than we have in modern history,” says Mark G. Holbrook, president and chief executive of the Evangelical Christian Credit Union of Brea, Calif., which specializes in lending to churches. The credit union has moved to foreclose on seven of its 2,000 member churches this year, and Mr. Holbrook says he expects to take similar action against two more next year. Before now, it had foreclosed on only two churches in its 45-year history. Church Mortgage &Loan Corp. of Maitland, Fla., another church lender, foreclosed on 10 church properties in the past couple of years. Unable to sell any of them, the company didn’t have the funds to pay more than 400 bondholders the estimated $18 million it owes, says company lawyer Elizabeth Green. Church Mortgage filed for Chapter 11 bankruptcy protection in March. Churches were long considered good credit risks, lenders say. Weekly collections tend to be steady, even during recessions, and churches feel a moral tug to pay debts. Most of the nation’s 335,000 churches carry little or no mortgage debt, and are based in buildings that were paid off long ago. But some churches, especially those not affiliated with major denominations, borrowed briskly to build or expand in recent years. Spending on construction of houses of worship rose to $6.2 billion in 2007 from $3.8 billion in 1997, according to the U.S. Census. Now, churches are seeing congregants lose jobs and savings. The 125-year-old Mount Calvary Missionary Baptist Church, of Jacksonville, Fla., borrowed about $2.6 million in 2002 to add a new education wing, reflecting pool and tower. In addition, the church’s 1,200 members pledged $1 million to the building campaign, but two-thirds of that money was never actually donated, according to the church’s pastor, the Rev. John Allen Newman. A quarter of the congregants soon stopped attending church, says Mr. Newman, so weekly collections started to dwindle. He and the church leaders cut staff and electricity use to save costs, but in January, facing a foreclosure judgment of $3.3 million, the church filed for bankruptcy protection. Mr. Newman says the church hopes to settle its debts and emerge from bankruptcy proceedings in the coming months. St. Andrew, the recently auctioned Maryland church, opened 17 years ago in a former sporting-goods store in downtown Easton. The town of historic colonial mansions and sprawling farms was once home to Frederick Douglass. More recently, the town has become a retreat for Washington’s elite. The rector of St. Andrew, Bishop Johnson, attracted like-minded conservatives who disliked Episcopal innovations, such as ordaining female priests. In 2005, the church borrowed $850,000 to buy a much larger space that had once belonged to a Roman Catholic parish. The 1868 Gothic revival structure was large for Bishop Johnson’s congregation of 50 people. But the gregarious Midwesterner, who once raised money for a ballet troupe and orchestra, said he was confident his ministry and donations would grow. “I’m well liked, I’m a lucky man,” he says he felt at the time. He wooed real-estate agents, bankers and well-heeled locals — some of whom didn’t even attend the church — and received pledges worth $200,000. Some donors said they were impressed with the bishop’s generous food pantry and help given to local Hispanics. For a time, Bishop Johnson said Mass in Spanish on Friday nights for workers at a crabmeat processor, and the parish also offered English classes. “He served a part of this community that often times does not get served well,” says Lee Denny, president of the local General Motors dealership. Mr. Denny, an elder in Easton’s Presbyterian Church, donated $10,000. But expenses mounted. There were mice in the basement and bats in the belfry. It cost about $45,000 to stanch creeping black mold. Once the local Catholic parish began saying Mass in Spanish, it drew off most of St. Andrew’s immigrant members. Weekly donations dropped to about $600 from $1,425 three years ago, says Bishop Johnson. And many of those who had pledged $200,000 toward the mortgage payments told the bishop they needed to delay their gifts, saying their stock portfolios were down. Last February, the church couldn’t meet its monthly interest payments. The lender, Talbot Bank, a unit of Shore Bancshares Inc., foreclosed in August, seeking $950,000, including principal and unpaid interest. It was one of five properties Talbot foreclosed on in two years, but the only church, says W. David Morse, a vice president at the bank. At the auction’s end, Bishop Johnson shook hands with Mr. Morse. “These people are not Wall Street bandits, for crying out loud,” the bishop said of his bankers. St. Andrew’s congregants will likely stay in the building for several more weeks while the bank seeks a buyer. The transaction gave James C. Andrew, the auctioneer, some pause. He was married in the building in 1997 when it was a Catholic church and his two children had been baptized there. “I’ll probably wind up with coal in my stocking for Christmas,” he said.